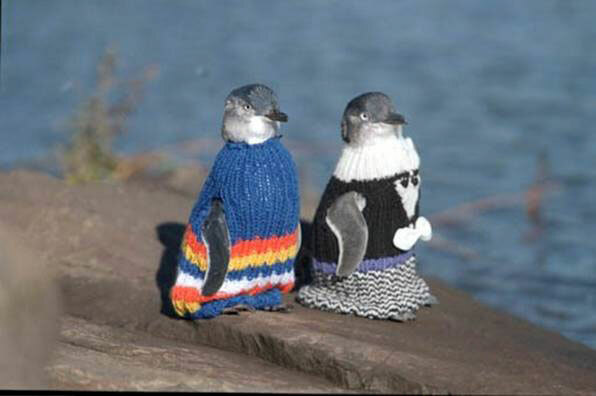 Following the recent oil spill in New Zealand, a local yarn shop has posted a pattern to knit penguin PJs for fairy penguins affected by oil from this catastrophic spill. Apart from being one of the cutest things I've seen this year, these knitted jumpers protect the penguins until they can be cleaned by keeping them warm and stopping them from pecking at their feathers and ingesting the toxic oil. The response from the knitting world has been incredible and there are now enough penguin PJs for the NZ oil spill, but any extras will be saved in case they are needed somewhere else in the future.